By knowing what is happening at an emotional level, we can understand the threat response, and address the potential loss in productivity. 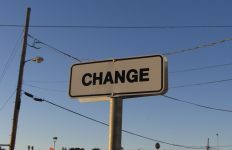 This is part 1 of a series of articles on ‘change hacks’ from expert change management speaker and facilitator Lena Ross. 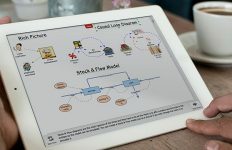 As the video above shows, in a disruptive, VUCA (volatility, uncertainty, complexity and ambiguity) world, many organisations are building enterprise change capability to address the challenges of continuous, complex change. Many moons ago, I wrote my first white paper on what the new insights from brain science can teach us about how people respond to change. Around this time, I also started running lunchtime sessions for change managers and leaders on this very topic at one of the ‘very big banks’. It was in one of these sessions a senior member in the audience asked me – well all this is very interesting, but how does it relate to our bottom line? Cha Ching! Great question! I made a mental note to make sure I referenced this point in my white paper. Here was another opportunity to promote the value of change management by discussing the ‘hidden cost’ of change resistance. All with the added benefit of linking it to the topic of how we can benefit from the new insights neuroscience can offer on human performance. Now, the change practitioners among you will be familiar with the change models and curves that refer to the ‘valley of despair’ and the ‘productivity dip’ that occurs when we introduce change. We recommend change interventions to help organisations minimise this dip in human performance that’s often difficult to measure in terms of dollars, but cannot be overlooked as a people-related cost. According to neuroscientists, the extent of the cost associated with this dip depends on whether we perceive the change as a loss or a gain. 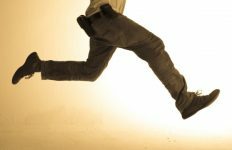 Our primal response is to avoid loss or run away from threat, and move towards reward or gain. The threat response triggers the same activity in our brains as when we experience physical pain. So, when we don’t like change, it does really hurt! And when we feel pain, we don’t feel like doing much else except to protect ourselves. Our response to loss is elegantly expressed in David Rock’s SCARF model of threat and reward1. When an element in SCARF is reduced or taken away, our brain activates a threat response. If we perceive it as a gain, we activate a reward response. Figure 1. SCARF model (source: Rock 2008). We can also apply the SCARF model as a framework for planning and delivering change. For example, we can assess the anticipated threat response of our stakeholders for each element of SCARF, educate our change champions on how it plays out, and then consider potential threat in how we frame our communication, and how we train and generally prepare people for changes. Unpack it and hack it! Disruption continues to demand unprecedented agility to remain competitive. Insights such as these, from neuroscience, offer organisations a clear value proposition. The application of these findings can only improve business success. Minimising threat means a more engaged workforce. And we know engaged workers are more productive and less resistant to change, so business benefits can be realised faster from transformation efforts. The more informed we are about what is happening at an emotional level, the better we ‘unpack’ the nature of the threat response, and ‘hack’ the potential loss in productivity. We can minimise that dip that often happens. Figure 2. 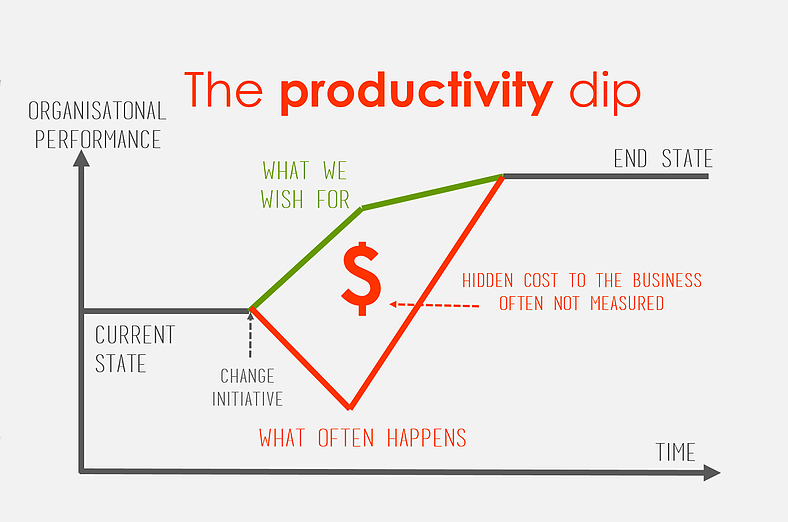 The productivity dip (source: adapted from the Kübler-Ross model). It’s great that now that we can observe and measure neural activity responses to new information and events, so we can confidently re-position the ‘soft science’ of change management as a hard one. It nudges us to think harder about how to reduce the ‘pain’ our people experience when introduced to change. 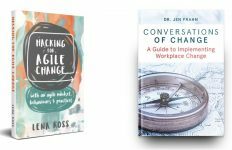 If you are a change leader, change manager, or change sponsor who would like to find out more about how this change hack can be applied in your change practice, please see this white paper. Next edition: Change hack 2: Hacking change with the magic numbers. Article source: Change hack 1: Hacking the productivity dip when we introduce change. With over two decades of experience in how we are hardwired to learn and change, I enjoy guiding teams and individuals through transformation. With a commitment for bringing out the best in others, I’m able to help people to recognise the ‘AHA’ moment that is needed to effect sustainable change. As an experienced and confident public speaker and facilitator, I challenge my audiences just enough to nudge them out of their comfort zone to devise action plans with commitment and purpose.